Tea and cakes aren't going away... Of all the vaguely retro traditions and fashions doing the rounds the institution of afternoon tea is the one I can most get behind. 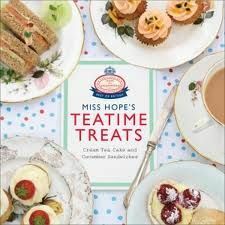 I know it never really went away but I truly believe it's something that should be encouraged at every opportunity - and the more elaborate the better - which is one reason why I'm always so pleased to see another tea book. It's such a civilised way of entertaining; lots of nice things to eat as well as the fun of making them, child friendly, and doesn't swallow up the whole day like lunch can, or the whole night like dinner will (both of which I enjoy. Tea is also an excuse for pretty crockery - if I had the storage space I'd have a nice collection of vintage cups and saucers but currently every available flat space (including much of the floor) is taken up with books, booze, and cooking pots, also I'm not desperate to have more things to dust. Happily tea is a meal that can accommodate a bit of mismatched china and a lack of formality as well as all out show stopping effort. I have mixed feelings about the jolly hockey sticks and gin tone of the Hope and Greenwood books; a little can go a long way when you're not in the right mood for it, though much like gin it's also something that can really hit the spot when you are in the mood. I'm fond of gin and a devotee of the fudge recipe in the first Hope and Greenwood book 'Life is Sweet' (great fudge; the perfect texture, lovely flavour, makes enough to eat plenty and share plenty) and since I first made that I regularly turn to these books for inspiration. 'Miss Hope's Chocolate Box' was the book that gave me the confidence to have a go at making my own chocolates - something that's great fun if a little bit fiddly. That fudge recipe meant I came to this book with high expectations and I don't think I'm going to be disappointed. There are two things that I'm initially quite excited about, the first being small cakes - not fairy cakes, proper cakes, only smaller - 5 inches to be precise. So that's a cake small enough for two to easily get through without totally overdoing it, big enough to share around a little further, small enough to justify making a couple for the tea table, big enough to hopefully leave a left over slice for the next day. 5 inch tins aren't the easiest size to find but they're out there and I now own one which I look forward to trying out soon. I'm also assuming that now I have a couple of recipes which give times, quantities, and temperatures I can adapt other fruit cakes - a whole world of little cakes. The second source of excitement is the drinks section; a really good mix of cold, hot alcoholic and alcohol free beverages. There is a recipe for Russian tea that calls for oranges, lemons, cloves, and sugar which sounds wonderfully exotic and warming - something between a cup of tea and mulled wine. Darjeeling gin fizz also sounds good, but nothing sounds better than the fireside rum tea with it's cinnamon, maple syrup, tea, and rum. There's a lot of god stuff here - maybe even enough to persuade me to clean up and invite people into my home for some sort of entertainment. Maybe.